Moreover, there are a number of proposed, and in some cases implemented, solutions to existing, contemporary problems that can be utilized for the purpose of minimizing overpopulation’s detrimental effects on living space and non-renewable resource constraints. These contemporary concerns include climate change and dependence on non-renewable energy sources, and they are only increasing in the amount of public attention they are attracting. While these concerns and their potential solutions were not created by overpopulation or with overpopulation in mind, the potentially negative effects of an increasing global population can be effectively combated all the same using such contemporary methods and technologies. This is an estimate of the birth rate and the death rate in the year 1000, birth rate roughly 70, death rate about 69.5. Remember when there’s a growth rate of 1 percent, very much like your money, a growth rate of 1 percent leads to a doubling time at about 69 to 70 years. It’s the same thing with humans. With a 1 percent growth rate, the population doubles in about 69 years. If you have the growth rate — if you double the growth rate, you have the time it takes for the population to double, so it’s nothing more than the difference between the birth rate and the death rate to generate the growth rate. And here you can see in 1900, the growth rate was about 2 percent, which meant the doubling time was about five years. During the 1950s at the height of the baby boom, the growth rate was about 3 percent, which means the doubling time was about 26 years. In the year 2000, we have birth rates of about 15 per thousand, deaths of about 10 per thousand, low mortality populations, which means the growth rate is about one half of 1 percent, which means it would take about 140 years for the population to double. In other words we will only have increased the doubling-time of the global population by a factor of 1.75 if we achieved indefinite longevity today (e.g., a doubling time of 140 years in 2000 compared to a doubling time of 80 years). This means that we will have two to four generations worth of time to consider possible solutions to growing population before we are faced with the “hard choice” of (1) finding new space and resources or else (2) limiting or regulating the global birthrate. An alternate study on the demographic consequences of life extension concluded that “population changes are surprisingly slow in their response to a dramatic life extension”. The study applied “the cohort-component method of population projections to 2005 Swedish population for several scenarios of life extension and a fertility schedule observed in 2005,” concluding that “even for a very long 100-year projection horizon, with the most radical life extension scenario (assuming no aging at all after age 60), the total population increases by 22% only (from 9.1 to 11.0 million)” and that “even in the case of the most radical life extension scenario, population growth could be relatively slow and may not necessarily lead to overpopulation.” . The total population increase due to the complete negation of mortality given by this study is significantly lower than the figure calculated by Olshansky. Finding innovative solutions to new and old problems is what humanity does. We have a variety of possible viable options to increase the resources and living space available to humanity already. Moreover, there are several other contemporary concerns that are invoking the development of technological and methodological solutions that can be applied to our own concerns regarding the effects of overpopulation. Surely we can conceive of optimal solutions to these problems (and the more pressing a given problem is, the more funding it receives and the faster the solution to it is accomplished) – and take advantage of the growing methodological and technical infrastructure being developed for related and convergent problems – within the time it will take to feel overpopulation’s effect on living space and resources. We could, for instance, colonize the oceans [3, 4, 5], drawing from the engineering, construction techniques used to build, maintain, and safely inhabit contemporary VLFSs (Very Large Floating Structures). 75% of the Earth’s surface area is, after all, water. This would increase our potential living space 3-fold – and I say “potential” because we surely don’t currently maximize living space on the 25% of the Earth’s surface occupied by land. Furthermore, humanity has as yet barely ventured beyond the surface of the earth – which is a sphere after all. There is nothing to prevent society building higher and building deeper. Indeed, with contemporary and projected advances in materials science and structural engineering, there is no theoretical limit to the height of structures we can safely build – the space elevator being a case in point. And while there will indeed be a maximum size wherein building higher becomes economically prohibitive (a limit determined to a large extent by the materials used), contemporary megastructures  indicate that very large structures can be built safety and cost-effectively. Underground living [7, 8, 9, 10] is another potential solution-paradigm as well; underground structures require less energy, are protected from weathering effects and changing temperatures to a much greater extent than structures exposed to the elements, and are less susceptible to damage from natural disasters. Furthermore, there are a number of underground cities in existence today , with existing techniques and technologies used to better facilitate contemporary underground living, which we can take advantage of. In fact, the problem of limited living space is a contemporary problem for certain nations like Japan, and active projects to combat this growing problem have already been undertaken in many cases. This means that there will be an existing host of solutions, with their own technological and methodological infrastructures, which we can benefit from and take advantage of when the problematizing effects of growing global population become immediate. Not only can we take advantage of the existing engineering methodologies developed for use in the construction of VLFSs, but we can also take advantage of the growing body of knowledge pertaining to megastructural engineering and even existing proposals for floating cities [12, 13, 14, 15, 17, 18]. Another possible solution is artificial islands . Furthermore, in recent years the topic of Very Large Floating Structures [21, 22] has experienced a surge of renewed interest occurring in tandem with the increasing interest in seasteading [23, 24], – that is, the creation of very-large-floating-structures for reasons of political sovereignty as well as to allow corporations to get around the laws of a given nation by occupying an area outside of exclusive economic zones. This renewed interest can only increase the amount of attention and funding these concepts receive, in turn increasing the viability of VLFS designs and their underlying structural-engineering and energy-production concerns. Another contemporary movement that will prove advantageous for our own concerns with the effects of overpopulation on living space, working space, and resource space is the growing green movement and sustainability movement. The problem of resource scarcity is already upon us in many areas, and there exists contemporary motivation for finding more resource-efficient ways of making energy and producing goods, and for lessening our dependency on non-renewable energy sources. Climate change has only become an increasingly predominant concern in international politics, and many incentives exist to lessen our dependence on non-renewable energy sources as well as to lessen the environmental impact of contemporary civilization, which is itself another oft-touted problematic concern possibly resulting from overpopulation. Developments in these areas are only set to continue, for reasons wholly unrelated to the effects of overpopulation, and when those effects come to the fore we will have a collection of existing methodologies that can then be harnessed to lessen the impact of overpopulation on living space and resource scarcity. The predominance of these problems, as well as the amount of attention and funding they are expected to receive (and thus the viability of their potential solutions), will only increase as we move forward into the future. The solutions we have to the potential problems of overpopulation – namely resource scarcity and lack of living space – will not only increase as the effects of overpopulation get closer, but the technological and methodological infrastructures underlying those solutions will also become more tried, tested, and robust, fueled by contemporary concerns over decreasing living space, climate-change and resource scarcity. While space colonization is the most frequently proffered technological solution to the possibility of future overpopulation, I think we will turn to various Earth-bound solutions to increasing humanity’s available living space, as well as the space available for agricultural labs, that is the manufacture of food-stuffs, or indoor farming systems [25, 26, 28], before colonizing the cosmos becomes an economically optimal option. I think these sorts of solutions will be employed long before humanity is forced to either regulate the birthrate or move into the cosmos. Moreover, people who wish to have children will have incentive to support politicians running on policies promoting new solutions to decreasing living space. Consider the number of U.S. taxpayer dollars spent during the Space Race, with no immediate material or scientific benefit (other than to prove it could be done, as well as to maintain rough militaristic equality with the USSR to some extent, as the state of rocket technology was indicative of the state of ballistic technologies like missiles). If humanity is forced to choose between having children and receiving the medical treatments that will keep them from dying, surely people will be motivated to fund initiatives and projects aimed at solving the problems of decreasing living space and increasing resource constraints due to a growing global population. It is important to remember that the largest increase in life expectancy we have experienced historically was followed by a drastic decrease in birthrate over the next few generations thereafter. Before the Industrial Revolution, English women had on average 6 children. In 2000 the average was less than 2. The drop in birthrate following the industrial revolution has several causes. Chief among them is the fact that children were considered to some extent as assets, helping with maintaining the family livelihood, often by doing agricultural work on a family farm or helping with household chores (which were much more extensive then). Another large determining factor is a high rate of child mortality; thus families would have multiple children in anticipation of losing some to death. But with a rise in living conditions, the child mortality rate dropped drastically – and as a result we stopped having more kids in anticipation of some of them dying. Moreover, we started treating children less as assets and more as people to nurture and raise for their own sake. Longer lives, and less susceptibility to death in general, appears to have made us better parents. Let us suppose, for a moment, the worst: that indefinite longevity is achieved and we completely ignore (i.e., fail to plan for) overpopulation until its effects start becoming readily apparent. Even in this seeming worst-case scenario, overpopulation is not likely to result in any great tragedies. In such a case we would be forced to limit the global birthrate until we are able to implement the solutions that would allow us to sustainably procreate again. If people have a strong enough desire to continue having children, then they will express their demand and politicians will consequently base their policies upon deliberative initiatives to increase available living and agricultural space – and get elected if the desire to freely procreate is strong and widespread enough. Failing to plan for overpopulation will simply be a wake-up call, letting us know that we should have been planning for its effects from the beginning, and that we had better start planning for them now if we want to continue to freely procreate. Thus while overpopulation is the most prominent and most credible criticism against continually increasing lifespans, and the one that needs to be planned for the most (because it will eventually happen, but it will lead to sustainability, resource, and living-space problems only if we do nothing about it), it is in no way insoluble, nor particularly pressing in terms of the time available to plan and implement solutions to shrinking living space and resource space (i.e., the space occupied by resources such as food, energy production, workplaces, etc.). We have a host of potential solutions today, ones we can use to increase available living space without regulating the global birthrate, and decades following the achievement of indefinite lifespans to consider the advantages and disadvantages of the various possible solutions, to develop them and to implement them. So then: where to from here? Overpopulation is still the most prominent criticism raised against indefinite longevity, and if combated, the result could be an increase in public support for the Longevity movement. You might think that the widespread concern with overpopulation due to increasing longevity won’t really matter, if they turn out to be wrong, and overpopulation isn’t so insoluble a problem as one is inclined to first presume. But this misses a crucial point: that the time it takes to achieve longevity is determined by and large by how strongly and in how widespread a manner society and the members constituting it desire and demand it. If we can convince people today that overpopulation isn’t an insoluble problem, then continually increasing longevity might happen much sooner than otherwise. At the cost of 100,000 deaths due to age-correlated causes per day, I think hastening the arrival of indefinite longevity therapies by even a modest amount is somewhat imperative. Hastening its arrival by one month will save 3 million lives, and achieving it one year sooner than otherwise will save an astounding 36.5 Million real, human lives. Thus, we should work toward putting more concrete numbers to these estimates. How much more living space can be feasibly created by colonizing the oceans? How deep can we really dig, build and live? How high can we safely build? Is there a threshold height or depth where building higher or deeper becomes too economically prohibitive to be worth the added living, working or resource space? What are the parameters (e.g., material strength/cost ratio, specific structural design) determining such a threshold? First, we need to collect and analyze the feasibility studies that have already been undertaken on floating cities, artificial islands, VLFSs and the new solution-paradigms that are emerging to combat the contemporary concerns of sustainability and resource scarcity. In short, we need to compile data from the feasibility studies that have already been done, and the projects already implemented. Then we need to plan and commission further feasibility studies, undertaken by engineers and geologists, to build upon the work already accomplished in feasibility studies pertaining to existing designs for floating cities and other Very Large Floating Structures. We need to put some numbers to the cost the additional space for food, resources, work and living necessitated by widely available life-extension therapies. We need to do some hard calculations to show that the effects of overpopulation are problems that can be solved using existing megascale engineering and construction techniques and materials, safely and economically. We need to show the world that it has more space than it ever thought it had, and that such solution-paradigms as cosmic colonization and procreative regulation are neither the only ones, nor necessarily the most optimal ones. We need, in short, to show them that, in this case, where there’s a will there’s a way, and that the weight of waiting is too high a price to pay. South, D. B., and Freda Parker. “Underground Homes – Good or Bad?” Monolithic, January 22, 2009. 06. Good Earth Plants & Greenscaped Buildings. “Underground Living.” Last modified May 6, 2013. 07. “Cities on the Ocean.” Technology Quarterly – The Economist. Q4 2011. Bonsor, Kevin. “How the Floating Cities Will Work.” HowStuffWorks. n.d. 11. DigInfo TV. “GREEN FLOAT – a Floating City in the Sky.” Accessed August 6, 2013. 12. National Geographic. “Pictures: Floating Cities of the Future.” Accessed August 6, 2013. 13. Emerging Technology News. “Self-Sufficient Floating Cities Planned for 2025: Japan.” Accessed August 6, 2013. 14. Nagy, Attila. “14 High-Tech Farms Where Veggies Grow Indoors.” Gizmodo, June 17. 20. Meinhold, Bridgette. “Indoor Vertical Farm ‘Pinkhouses’ Grow Plants Faster With Less Energy.” Inhabitat. Last modified May 23, 2013. 21. TerraSphere. “Urban farming 2.0: No soil, no sun.” Accessed August 1, 2013. 22. Author’s Note: The following is a transcript of a talk given at the recent Radical Life Extension Conference held in the U.S. Capitol on September 22,2013. Talks were also given by Antonei B. Csoka, Gabriel Rothblatt, Tom Mooney, Mark Waser, Gray Scott, Josh Mitteldorf, Maitreya One, Jennifer ‘Dotora’ Huse and Apneet Jolly. A special thanks to David Pizer for making this article available for distribution at the upcoming Society for Venturism 2013 Cryonics Conference in Laughlin, Nevada, on October 25-27th. I would like to address what I consider to be three common criticisms against the desirability and ethicality of life-extension I come across all too often – three specters of immortality, if you will. These will be (1) overpopulation (the criticism that widely available life-extension therapies will cause unmanageable overpopulation), (2) naturality (the criticism that life extension is wrong because it is unnatural), and (3) selfishness (the criticism that life-extension researchers, activists, and supporters are motivated by a desire to increase their own, personal lifespans rather than by a desire to decrease involuntary suffering in the world at large). But first I would like to comment on why this would be important. I would consider two of the three critiques – namely the naturality critique and the selfishness critique – to be largely unfounded and vacuous; I don’t think they will be real worries when comprehensive life-extension therapies arrive. I think that the overpopulation critique does have some weight to it; we do in fact need to plan for and manage the effects of a growing population. However, the overpopulation critique is wrong in assuming that such affects will be unmanageable. So if at least 2 of these 3 critiques are largely unfounded, then what’s the worry? Won’t they simply disappear when life extension is achieved, if they are really so baseless? Well, yes, but the possibility of their turning out to be right at the end of the day is not what makes them worrying. What makes them worrying is the fact that they deter widespread support of life extension from the general public, because they stop many people from seeing the advantage and desirability of life extension today. A somewhat common, though thankfully not predominant, attitude I find from some longevity supporters is that work is being done, progress is being made, and that the best course of action for those who want to be around to benefit from the advances in medicine already on the developmental horizon is simply to live as healthily as we can today while waiting for tomorrow’s promise. I don’t think this attitude necessarily deters progress in the life-extension field, but I certainly don’t think it helps it very much either. I think such people are under the pretense that it will take as long as it needs to, and that there is nothing the average person can really do to speed things up and hasten progress in the field. Quite to the contrary, I think every man and woman in this room can play as central a role in hastening progress in the field of life extension as researchers and scientists can. This is largely due to the fact that just what is considered worthy of scientific study is to a very large extent out of the hands of the average scientist. The large majority of working-day scientists don’t have as much creative license and choice over what they research as we would like to think they do. Scientists have to make their studies conform to the kinds of research that are getting funded. In order to get funding, more often than not they have to do research on what the scientific community considers important or interesting, rather than on what they personally might find the most important or interesting. And what the scientific community considers important and worthy of research is, by and large, determined by what the wider public considers important. Thus if we want to increase the funding available to academic projects pertaining to life extension, we should be increasing public support for it first and foremost. We should be catalyzing popular interest in and knowledge of life extension. Strangely enough, the objective of increased funding can be more successfully and efficiently achieved, per unit of time or effort, by increasing public support and demand via activism, advocacy, and lobbying, rather than by, say, direct funding, period. Thus, even if most of these three criticisms, these specters of immortality, are to some extent baseless, refuting them is still important insofar as it increases public support for life extension, thereby hastening progress in the field. We need massive amounts of people to wake up and very explicitly communicate their desire for increased funding in biomedical gerontology, a.k.a. life extension. I think that this is what will catalyze progress in the field – very clear widespread demand for increased funding and attention for life extension. This is something I think each and every man and woman here today can do – that is, become a life-extension activist and advocate. It is not only one of the easiest ways in which you can contribute to the movement – it may very well be the most important and effective ways that you can contribute to the movement as well. Send an email to the International Longevity Alliance (info@longevityalliance.org), an organization dedicated to social advocacy of life extension, which is compiling a list of life-extension advocates and networking them together. Arrange and organize your own local life-extension rally or demonstration, like the one held last year in Brussels. This could be as easy as holding up signs supporting scientific research into aging in the most traffic-dense location in your local area, recording it, and posting it on YouTube. Firstly, I’d like to turn a critique of the possible undesirable societal and demographic repercussions of life extension. The most prominent among these kinds of critiques is that of overpopulation – namely that the widespread availability of life-extension therapies will cause unmanageable overpopulation and a rapid depletion of our scarce resources. I think this critique, out of those three critiques addressed here, is really the only one that is a real worry. That is because potential negative societal repercussions of life extension are a real possibility, and must be appropriately addressed if they are to be avoided or mitigated. And don’t get me wrong – they are manageable problems that can be handled if we make sure to plan for them sufficiently, and allocate enough attention to them before their effects are upon us. According to some studies, such as one performed by S. Jay Olshanksy, a member of the board of directors for the American Federation of Aging Research (and the foremost advocate and promulgator of the Longevity Dividend), if the mortality rate dropped to zero tomorrow – that is, if everyone in the world received life-extension therapies comprehensive enough to extend their lives indefinitely – we would experience a rise in population less than the growth in population we experienced following the Post-World-War-II baby-boom. Global society has experienced dramatic increases in population growth before – and when that happened we extended and added to our infrastructure accordingly in order to accommodate them. When significant increases in life extension begin to happen, I expect that we will do the same. But we must make sure to plan ahead. Overpopulation will be an insoluble problem only if we ignore it until its perceptible effects are upon us. Another contemporary solution paradigm we can leverage to help mitigate the detrimental effects of overpopulation on living space is seasteading. This is the notion of creating permanent dwellings and structures at sea, essentially floating cities, outside of the territory of governments – more often than not to get around legal complications relating to whatever the prospective seasteaders wish to do. This movement is already bringing about designs and feasibility studies relating to the safe construction of very large floating cities. The most common solution-paradigms proposed to combat the problems of resources and living space are space colonization and regulating how many children people can have. I think that long before we turn to these options, we will begin to better maximize the existing living space we have. 75% of the earth’s surface area is water. I think that we will colonize the oceans long before space colonization becomes a more economically optimal option. Further, we currently don’t use the living space we have very well. We live on the surface of a sphere, after all. There is nothing in principle preventing us from building taller and building deeper. We can take from existing proposals and feasibility studies pertaining to megastructures – that is, very large man-made structures – to build much bigger than we currently do. Another existing field that can help lessen the potential resource-depleting effects of a growing global population is agricultural labs, indoor farming systems, and vertical farms. Such systems are in use today for large-scale food production. This would allow us to take all the space we currently have devoted to agriculture (roughly 40% of earth’s total land-area according to some estimates – see here and here) and move it underground or indoors. Besides which, “naturality,” insofar as it pertains to humans, is an illegitimate notion to begin with. For us human beings, naturality is unnatural. It is we who have cast off animality in the name of mind, we who have ripped dead matter asunder to infuse it with the works of our mind – we who have crafted clothes, codes, cities, symbols, and culture. Since the very inception of human civilization, we have very thoroughly ceased to be natural, and to such an extent that unnaturality has become our first nature. Firstly, one thing that I think undercuts the critique of naturality rather well is the known existence of biologically immortal organisms. There are in fact known organisms where the statistical probability of mortality does not increase with age. Meaning that if one kept these organisms healthily fed and in a good environment for them, then they simply shouldn’t die. Not only are there proofs of concept for biological immortality – but it can be found in nature unmodified by man. Hydras, small freshwater organisms, do not undergo cellular senescence and are able to maintain their telomere lengths throughout continued cell division. The jellyfish Turritopsis Nutricula can, through a process called cellular transdifferentiation, revert back to the polyp stage (an earlier stage in its developmental cycle) a potentially indefinite number of times. Planarian Flatworms also appear to be biologically immortal, and can maintain their telomere lengths through a large population of highly proliferative adult stem cells. And if you can believe it, an organism as commonplace as the lobster also appears to be biologically immortal. Older lobsters are more fertile than young lobsters, and they don’t appear to weaken or slow down with age. I also think that this is great proof of concept for people who automatically associate the magnitude of the endeavor with its complexity or difficulty, and assume that achieving biological immortality is technically infeasible simply due to the sheer profundity of the objective. But in regards to naturality, I think the existence of such biologically immortal organisms goes to show that there is nothing necessarily unnatural about biological immortality – because it has already been achieved by blind evolution in various naturally-occurring biological organisms. Thirdly, I think that religion itself exemplifies our desire for indefinite lifespans. This may seem counter-intuitive considering that many criticisms of life extension come from underlying religious arguments and worldviews – for instance that we shouldn’t be playing god, or messing with the way god created us. But the fact is that most religions have a conception of the afterlife – i.e., of eternal life following the physical death of the body. The fact that belief in an afterlife is a feature shared by almost all historical religions, that belief in an afterlife was conceived in a whole host of cultures independent of one another, shows that indefinite lifespans is one of humanity’s most deep-rooted and common longings and desires – indeed, one so deep-rooted that it transcends cultural distance and deep historical time. Now I’d like to turn to the third specter of immortality – the criticism of selfishness. Whereas the first specter of immortality was a critique of the ethicality of life extension, this second specter is more a moralistic critique of the worthiness of actually spending one’s time trying to further progress in the field today. The view that life-extension researchers, activists and supporters are arrogant for thinking that we somehow deserve to live longer than those that came before us – as though we were trying to increase public support for and interest in life extension merely for the sake of continuing our own lives. This, too, is, I think, a rather baseless criticism. Every life-extension researcher, activist, scholar and supporter I know does it not solely for the sake of their own lives but for the sake of the 100,000 people that die every day due to age-correlated causes. That’s right, ladies and gentlemen, 100,000 people will die from aging today, lost forever to causes that are in principle preventable and ultimately unnecessary. There are roughly 86,000 seconds in a day. That works out to a little more than one death per second. That’s about equal to the entire population of Washington, DC, dying every week, 3 million preventable deaths per month, and 36.5 million deaths per year. A group larger than the entire population of Canada will die from aging this year – and the fact that it sickens so few of us is incredibly sickening to me. This is an untenable situation for a civilization as capable as ours – we who have reshaped the world over, we who have gone to the moon, we who have manipulated atoms despite out fat monkey fingers. Humanity is an incredibly powerful and unprecedented phenomenon, and to say that we simply cannot do anything about death is to laugh in the face of history to some extent. Recall that very learned and esteemed men once said that heavier-than-air flying machines – and a great many other things we take for granted today – are impossible. Doing something about this daily cataclysm is what drives my own work, and the work of most every life-extension supporter I know. The life-extension movement is about decreasing the amount of involuntary suffering in the world, and only lastly about our own, personal longevity, if at all. The eradication of involuntary death via science and medicine is nothing less than the humanitarian imperative of our times! And again, this is something that I think each and every one of you can take part in. Become a life-extension supporter, advocate and activist. It may be not only the easiest way that you can contribute to hastening progress in the field of life extension, but the most effective way as well. Thank you. Longevitize! : Essays on the Science, Philosophy & Politics of Longevity is a new and (literally) vital compilation, edited by Franco Cortese, which assembles perhaps the widest array of resources on radical life extension in one location. You can read a detailed description of the book here. Cortese’s ambitious projects have breathed new life into the transhumanist and immortalist movements, and Longevitize promises to be perhaps his most influential contribution to date, illustrating a thorough grasp of the current state of the efforts to defeat senescence and enable humankind to transcend its primordial limitations. In addition to 164 articles representing diverse perspectives about the scientific, philosophical, and political aspects and implications of indefinite life extension, this compendium includes an immensity of links to external resources, including books, articles, and videos. I am proud that my Resources on Indefinite Life Extension (RILE) page formed the crux of the book’s Appendix II. Longevitize permits the reader to delve as deeply as can be desired into studying the feasibility, desirability, and possibilities for implementation of the defeat of senescence and involuntary death. I am proud to have contributed 27 essays to this anthology, spanning 9 years of my thinking and writing on the prospect of indefinite longevity. 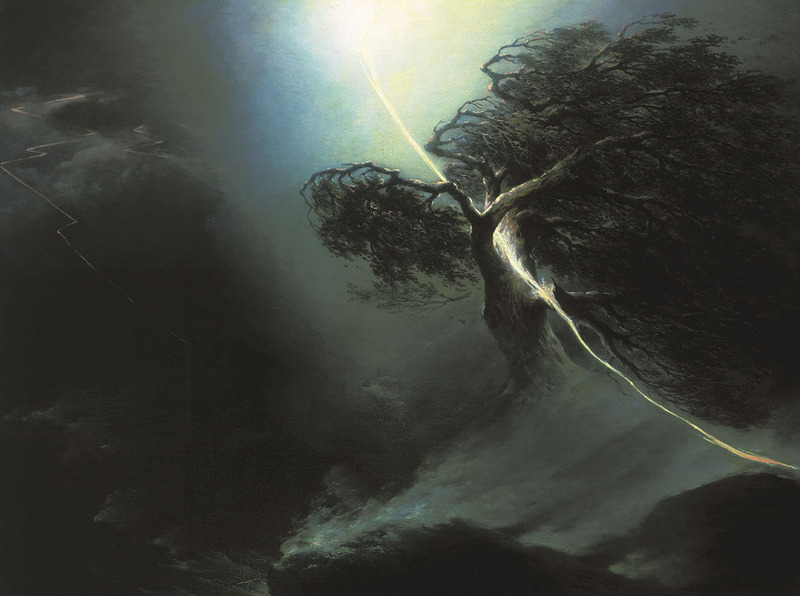 In addition, the excellent cover was designed by my wife Wendy Stolyarov, incorporating Maxim Vorobiev’s 1842 painting, “Oak fractured by a lightning bolt. Allegory on wife’s death.” Death destroys our irreplaceable individual universes much like that lightning destroyed the tree. It is time to put an end to this travesty, and Longevitize offers an amazing toolkit and intellectual foundation for doing so. Buy this book, read it, and use it in your further intellectual explorations – including your writing, research, argumentation, and activism. Right now, Longevitize! is available as an e-book for $9.99, both in PDF and MOBI formats, from Amazon. A hard-copy version is currently being prepared. What if humans only lived to age 20? Consider how much less it would be possible to know, to experience, and to do. Most people would agree that a maximum lifespan of 20 years is extremely circumscribing and limiting – a travesty. However, it is only because we ourselves have lived past such an age that we feel intuitively as though a maximum lifespan of 20 years would be a worse state of affairs than a maximum lifespan of 100. And it is only because we ourselves have not lived past the age of 100 that we fail to have similar feelings regarding death at the age of 100. This doesn’t seem like such a tragedy to us – but it is a tragedy, and arguably one as extensive as death at age 20. Another reason informing our concern with death at age 20 and our relative ease with death at 100 is the notion of living long enough to do enough. Death at age 20 for the most part seems to preclude such experiences as parenthood, to birth a child and watch him grow into personhood, whereas a 100-year-old will have had enough time to have children, to watch them grow, to work and to enjoy the fruits of his or her labor through leisure in retirement. Our ignorance regarding the real scope of possibility, of possible experience and possible modes of existence, also informs our relative unconcern with death at age 100. We feel that there is a limited number of things for one to do in life, or at least things that are qualitatively unique enough to be considered as being truly distinguishable from the rest. But we couldn’t be more wrong. It’s hard to step outside culture sometimes, and easy to naively look upon a foreign culture as embodying but a very limited number of archetypes and stereotypical caricatures of their true depth and diversity. There are more contemporary cultural traditions and conditions that can be practiced and experienced than there are years to actually do so. Likewise, there is more history to learn about than time available. The current breadth and depth of the world and its past are far too gargantuan to be encompassed by a mere 100 years. If you really think that there are only so many things that can be done in a lifetime, you simply haven’t lived long enough or broadly enough. There is more to the wide whorl of the world than the confines and extents of our own particular cultural narrative and native milieu. More than this, the startling diversity of the world and stark heterogeneity of history are only set to continue their upward growth into spaces unknown as we move into the plethora of futures before us. More information is being produced than can be kept up with. Culture has always been changing, but today the pace of that change is swifter than ever before. The thought that boredom would ever be an issue to longer-living people is simply laughable. Not only does the world currently contain more than it is possible to know in a single century, but it is accumulating ever more depth and diversity every day, and at an accelerating pace. You couldn’t catch up with history in the first place, and you’re sure to gain more ground to cover than you can possibly encompass, faster than you can get a hold of it, as life expectancy experiences further increases. Another condition informing our concern with death at 20 and our relative unconcern with death at 100 is the decline of function as we age. Bodily suffering and functional decay increase as one grows with age, and often we look upon the elderly as beings more defined by their encumbrance, by what they have lost, than by what they still possess. What will life be like, we wonder, when bodily motion becomes a battle, and when the simple experience of motion in an embodied world is complimented at every turn and twist by heat, friction, and pain, when living as we once did when young becomes a labor, and leisure is really just that? Or perhaps worse, when our minds begin to fall out from under us, to fail, as we are left to look on in horror from the inside-out, looking in? Lucky for us, we’re wrong; and even if we weren’t, we are still lucky that it is a transient tragedy, a temporary and ultimately remediable one. These men and women are more than the sum of what they have lost. They are living, breathing, thinking and valuing beings. They are! It’s as simple and stunning as that: they exist! To think that they might be better off, happier, in the rest of death and quiet of last breath – to think that they are beings defined most fundamentally by suffering, and by a comparison of what they no longer are, is not only wrong but perverse. They are living, and life so long as it’s lived should never be defined by suffering, by a lack or comparison of what it isn’t, but rather by what it is and still is. There are exceptions, of course; rapidly debilitating disease, unremitting pain, incomprehensible horror at the slow decay of mind. But I would argue confidently that the elderly are not in constant woe of that which they can no longer do. Like living beings, they deal with it and continue on in the business of being. To consider the elderly as “waiting for the rest and peace of death” is a dangerous and ugly notion, and one very far from the truth. Luckily, functional decline as a correlate of age is on the way out. We will live to 100 not in a period of decline upon hitting our mid-twenties, but in a continuing period of youthfulness. There are no longevity therapies on the table that offer to truly prolong life indefinitely without actually reversing aging. Death and aging are not separate things or processes; death is when aging has won the battle. Aging is slow death, and a truly-indefinite delaying of death ipso facto necessitates a reversal of aging, and a remediation of the physiological conditions that ultimately lead to death (i.e., what we colloquially call aging). To think that we will be prolonging our lives not as youthful beings of whatever physiological age we so desire but instead as elderly, age-ravaged beings patching new holes and bracing old crutches, is to some extent mistake the cause for the symptom. If we prolong life significantly, we will prolong the healthy portion of our lives first and foremost. The centenarians of next century will look as healthy as the 20-year-olds of last. Thus, one of the impediments preventing us from seeing death at 100 as a tragedy, as dying before one’s time, will be put to rest as well. When we see a 100-year-old die in future, he or she will have the young face of someone who we feel today has died before their time. We won’t be intuitively inclined to look back upon the gradual loss of function and physiological-robustness as leading to and foretelling this point, thereby making it seem inevitable or somehow natural. We will see a terribly sad 20-year-old, wishing they had more time. We will be able to envision with vivid viscerality the bright and buoyant things they could be doing were they not bedridden and stricken with sickness unto death. Moreover, that gradual decline into visually apprehensible old age also highlights another impediment to seeing the elderly as continually growing beings with a future to look forward to rather than fight against. The gradual decline of our mental faculties makes it seem that we would be accumulating experience and memory at a deficit, cumulatively losing the ability to think, judge, remember, and experience. Thus old age conjures to mind more senility than wisdom for many people. This, too, is less true than delusive. Again, this type of thinking is engendered by comparing what they seem to be with what they aren’t or once were. In any case, it will be even less true in the future, when longevity therapies restore our mental health to its youthful glory. Then, the prospect of ever-continuing experience and personal growth, ever-accumulating wisdom and knowledge, ever sharper consideration and discernment, is not so intuitively improbable. The claim that we can in fact continue to grow in how smart, ethical, knowledgeable, and deliberative we are will not be so easily balkable when one’s physiological state ceases to be an indicator of one’s chronological age. If some people refuse to consider in light of new evidence or perspective that their theory is wrong, refuse to allow the series of thought leading to the realization that all they have worked for is of lesser importance now, the most obvious cause of discontent would seem to be the notion of their own onrushing death. “If my theory is wrong, there isn’t time – or perhaps just youthful vigor – enough to do it all over again from scratch.” Someone worked his lifetime to achieve recognition in his field, and with his death so close around the corner, he faces the prospect of having all that work and worth be devalued by new developments. It is a scary thought, and the notion that people willingly or subconsciously refuse to consider facts that undermine their theory, and its perceived worth in their field, is least conceivable under such conditions. Thusly considered, Planck’s notion doesn’t appear as naïve as it first seemed. But this is the very concern set to be alleviated by longevity therapies. If the concern with being wrong is most impacted by one’s impeding death, and the fact that one wouldn’t have the time or energy to create another groundbreaking paradigm upheaval in their chosen field should one’s namesake-theory prove to be mistaken, then the arrival of longevity therapies should not only fail to exasperate and aggravate this situation, but indeed may even ameliorate or negate it, allowing people to let their theories go under the comforting thought that they have all the time in the world to do it again. My friend and peer Gennady Stolyarov II combats this criticism admirably, arguing that such instances occur due to the functional decline that comes with graceless old age, due to senility and a loss of mental flexibility. I think there is definitely some weight and worth to this consideration. And luckily, this, too, is a concern that is alleviated rather than aggravated by the introduction of longevity therapies. Longevity therapies will increase our healthy lifespans rather than stretch out the slow rot of our old age, as remarked earlier. Thus the longevity therapies that many critics argue could exasperate this progress-stalling state of affairs could, along yet another line of argumentation, constitute the very thing that jolts this state of affairs into reform. If senility and loss of mental flexibility contribute to Planck’s notion that life (or more properly the absence of timely death) forestalls scientific progress, then longevity therapies may constitute the source of senility’s demise and mental flexibility’s restoration. In any case, even if we accept Plank’s notion as true, and conclude that indefinite longevity will aggravate rather than alleviate this state of affairs, faster progress in the sciences or the humanities is no justification for simply doing nothing to negate physically remediable sources of death and disease. It seems to me a truism that we get smarter, more ethical, and more deliberative as we age. To think otherwise is in many cases derivative of the notion that physiology and experience alike are on the decline once we “peak” in our mid-twenties, downhill into old age – which does undoubtedly happen, and which inarguably does cause functional decline. But longevity therapies are nothing more nor less than the maintenance of normative functionality; longevity therapies would thus not only negate the functional decline that comes with old age, and with it the source of the problem arguably at the heart of the concern that longer life will slow progress even more, but might even constitute the only foreseeable fix to the problem by definition, because indefinite longevity is defined as (or more properly, synonymous with) the maintenance of normative functionality, a.k.a. the indefinite prevention of functional decline. There is no reason to expect that, in a time when we age without functional decline, the ethicality and experience of each human being wouldn’t increase as we age just as they arguably do as we age from two to twenty to thirty. Increasing longevity will not bring with it prolonged old-age, a frozen decay and decrepit delay, but will instead prolong our youthful lives and make us continually growing beings, getting smarter and more ethical all the time. Indefinite longevity will not slow progress, it will accelerate it! Instead of having thinking, being beings die after ten decades, they can continue to think and be. They can build upon the edifice of their existence and experience continually, reaching heights unheralded in flighty fits and bounds. Moreover, increasingly more and more people may very well be a boon to the momentum of progress. It could be argued that the increasing rate of progress was aided by the increase in global population that preceded it, providing not only more people to have more thoughts, but more people to challenge existing thought and to provide feedback accordingly in forward fashion. Statistically speaking, more people should mean more ideas, and more ideas should mean more good ideas, all else being equal. Thus indefinite longevity will better progress, not deter it, and will do so on the scale of both self and society. We will continue to grow, to learn, and to yearn. But more than that – we will continue to be – and that in itself is cause for good pause. In all our worry about stalled progress and boredom, we forget that even if indefinite longevity didn’t bring with it a host of advantages and boons to the boom of progress and exalted strife intrinsic to life, the ability to simply continue being is incommunicably better than the alternative, which does nothing but put an end to all other alternatives.